The University of Arizona reports that it receives a great deal of outside research funding every year. According to the school’s annual report, the University of Arizona received $454.4 million in awards for research in 2012. The College of Medicine was awarded $191.9 million, and $112.7 million of this funding went towards research costs alone. In addition to this latest $3.7 million cancer center support grant and the University of Arizona’s outside research funding report, the university receives a great deal of NIH and NSF funding that allows researchers interested life science products and lab products to meet their laboratory needs. In 2012, the NIH awarded the University of Arizona $83.3 million in research funding, while the NSF awarded the university $51.5 million that same year. For a full list of departments and projects receiving NIH and NSF funding at the University of Arizona, please visit the NIH website and the NSF website. If you are a lab supplier interested in marketing your life science products and lab products, you may want to take note of upcoming Arizona life science marketing events. Biotechnology Calendar, Inc. invites all lab suppliers to exhibit at our annual Tucson BioResearch Product Faire™ Event on October 9th, 2013. 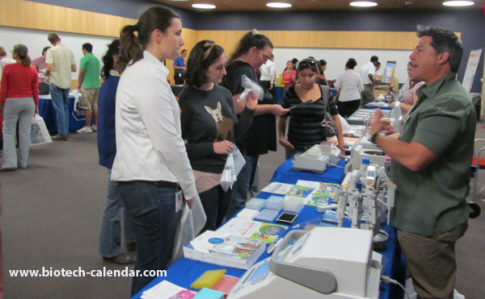 Last year’s Tucson BioResearch Product Faire™ Event attracted 151 attendees. Twenty-five of the attendees were purchasing agents, professors and post docs, and 25 were lab managers. The visitors came from 23 different research buildings and 41 departments around campus. Biotechnology Calendar, Inc. is a full-service science research marketing and events-planning company that organizes life science marketing events at top research universities nationwide. If you’re interested in selling your life science products and lab products at life science marketing events closer to home, we encourage you to view our 2013 calendar of events. For more detailed funding statistics on the University of Arizona, or to learn more about the Tucson BioResearch Product Faire™ Event, click on the button below.